I have finally gotten those stinkin' Bananas I hate so much up off the counter on a hook, where they don't seem to bother me as much. We also constantly have pears, tomatoes, avocados, among other produce, ripening on the shelf, which looks messy and takes up a lot of room. This product solves all of those problems at once! The design it ingenious! My only issue is that the bowl is much bigger than I had expected, though the dimensions were given in the product description. It is also much heavier than anticipated, but it must be, to balance the banana hanger! 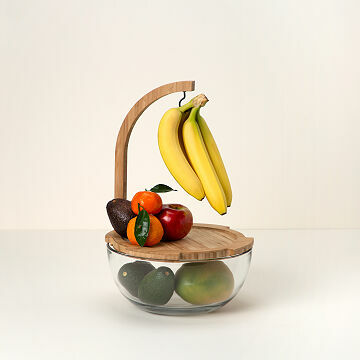 This product is very high quality, love having the cutting board included! This will be my go to gift for weddings and new homes gift! Love the clean, sculptural appeal of it on my large countertop. Adds a great dash of color to my white kitchen while keeping the fruit immediately available. Please keep doing what you are doing to offer such great items at good pricing.